Many analysts and pundits have declared this? to be the year of Social Selling. Usually I turn and run when pundits announce the Next New Trend®, but this time I think there’s some truth to the hype. The question is, what exactly does Social Selling mean? If you’ve spent any time in sales, you know selling has always been social. Whether you’re selling door-to-door or pitching Fortune 500s, you don’t get anywhere in sales if you don’t know how to build personal rapport with your prospects. But the term Social Selling means engaging prospects through Social Media, and while many of the fundamentals are the same, the medium is decidedly different. So let’s take a deeper look at the Social Selling trend and what it really means. All the current trends in social media touch on the same theme: How do you leverage the latest available tools and data to better connect with customers? Why is Social Selling a Thing? The real significance behind Social Selling is that we’ve reached a critical tipping point in the trajectory of social media. Sure, most of us are tired of hearing social-this and social-that, but after years of hype and counter-hype, after endless debate over whether social media is a fad or a force to be reckoned with, companies have finally moved past experimentation and settled in to adoption. We have a variety of metrics to address ROI, we have robust platforms to manage and measure performance, we’ve moved beyond the argument that social media is just about branding and we’re learning how to leverage it to generate leads. No, it’s not easy. It’s still hard work to put all these pieces together. But for companies that have been making an investment in social media for years, integration with sales and marketing is the new frontier. There are a host of related trends that you’ve undoubtedly heard a lot about. Content Marketing. Inbound Marketing. Social Media Management. Even Big Data Analytics. All of these trends touch in some way on the same general theme: How do companies leverage the latest available tools and data to better connect with prospects and customers? The rise of Social Selling doesn’t mean all these other trends have run their course, it just means that businesses at the head of the pack have pieced together enough to move on to the next big challenge—how to use social media to generate revenue. In other words, we’re reaching the Slope of Enlightenment with social marketing technology. Ready or not, now you get to hear all the fevered pitches from pundits and gurus who want to be on the leading edge by telling you how to sell on LinkedIn and Twitter. Social Selling as a business trend really signifies the transition and scaling of a company’s social media efforts beyond reputation management and brand building, and into the company’s demand generation process. In simple terms, Social Selling just means reaching out and engaging prospects online. If you’re already involved in professional group discussions on LinkedIn, maybe you’ve had someone respond to one of your brilliant comments and ask for advice that led to a discussion about working together. It’s really no more mysterious than that. Where it gets complicated is when you try to turn Social Selling into a repeatable process—a machine for consistently generating opportunities to talk about business with qualified prospects. And if you try not only to make it repeatable but also to make it scale, it gets complicated—in fact, it can get downright ugly. Behind the scenes, LinkedIn, Twitter, Facebook and every other social media platform are battling for their souls in a delicate balance between making revenue from marketers who’d like to reach people like you, and protecting you from the tidal wave of spam your profile would otherwise attract. So beyond the basic concept of an individual sales rep engaging prospects and customers in a social channel, Social Selling as a business trend really signifies the transition and scaling of a company’s social media efforts beyond reputation management and brand building, and into the company’s demand generation process. As you can imagine, such a prospect is ripe with opportunities and pitfalls. There is the age-old divide between marketing and sales, which only becomes more complicated with a new layer of social media management and lead generation. There are new tools and systems to adopt, adapt and integrate. There are new rules of engagement that will govern how internal teams will collaborate, in addition to third party partners and affiliates. Those are all in-depth posts in their own right. For now let’s stick with the broad strokes. Many businesses like outbound marketing because they perceive it to be easier and more predictable, but it’s also the kind of marketing that annoys customers with its noisy persistence. How Does Social Selling Work? In simplistic terms, there are two approaches to Social Selling that track right along with one of the tectonic shifts disrupting marketing today: Inbound vs. Outbound. With Inbound marketing and sales, you develop content that speaks to the needs and concerns of a target audience, you place that content where the audience will find it, and you engage with those prospects who respond to what you’ve written–you draw them in. It works, but it’s also hard work. Coming up with the right content, being consistent in cadence and focus, staying relevant and timely with respect to your market’s concerns, these are all difficult tasks. Doing them well also happens to be a skill that perfectly demonstrates your value to your market—that you have the interest and capacity to truly understand and address your market’s key challenges. Outbound marketing and sales focuses on identifying prospective customers through their social media profiles and messaging them directly with an introduction or an offer—basically email marketing adapted for social media. Outbound relies on scale and automation, because the response rates are typically fractional and require low-cost scaling to deliver returns. Many businesses like outbound because they perceive it to be easier and more predictable than content and engagement marketing. However, it is also the kind of marketing that tends to annoy many customers with its noisy persistence. To sum it up: With inbound, if you write seriously good content relevant to your customers they will respond, and they will ask for more information about what you offer. With outbound, if you push your message in front of a huge number of people, some fraction will respond to whatever you offer. If you’re selling a commodity product with low margins, outbound marketing and sales may be fine. If you’re selling a premium product where market reputation matters, inbound is likely a better bet. One of the problems with outbound is that the tools that make it easily scale at low cost attracts hordes of businesses to the practice, which only adds to the noise that overwhelms customers. Response rates to email, telemarketing and other forms of outbound, or “interruption marketing” as they’re sometimes collectively called, have been declining for years. That decline has elevated interest in inbound approaches, because they offer a different way to reach customers and build awareness, but it’s also made outbound via social a hot trend, because it offers a new spin on old tactics that seems fresh and not yet overused. The biggest problem with an inbound approach is that it takes a lot of diligence and effort to consistently tune in to market dialog, to post regularly to social networks where you want to build a reputation, and to develop compelling content that attracts good prospects. There are a growing number of tools that address these challenges (including our own SocialRep platform), by simplifying the process of creating, optimizing and syndicating the right content, and these tools are rapidly becoming assimilated into CMS and CRM systems. If you’re selling a commodity product with low margins, a low premium on reputation, or low competition, outbound marketing and sales may be fine—you churn through a lot of leads, and you’re not worried about annoying the ones who aren’t ready to buy. If you’re selling a premium product where market reputation matters, inbound is likely a better bet. You have to do the hard work that lies behind good content marketing anyway—to know your customers well enough to speak to their concerns every day—and you can’t afford to alienate prospects just because they aren’t ready to buy today. 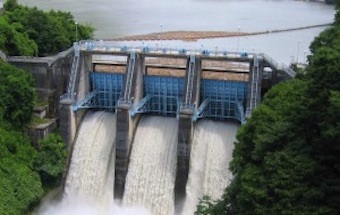 Sales Reps convert water flowing over the dam into revenue. Social Reps focus on making sure there’s always a steady supply of water behind the dam. What About a Middle Ground? Yes, there is a middle ground, where outbound and inbound processes intersect, where marketing and sales coordinate rather than collide, and create a fertile environment for good Social Selling. In fact, there are a number of middle ground methodologies, where outbound techniques can be used to increase traffic to published content, where inbound techniques can be used to build a thought-leadership position in targeted online communities, where inside sales teams can be leveraged to qualify prospects who engage with inbound content, and where inbound content can be used again to nurture leads that aren’t ready to buy. The key is to map out your pipeline for customer engagement, blending the perspective and needs of the customer with the functions your sales and marketing teams need to execute (segmentation, qualification, etc), and matching your content and placement to engage prospects and win customers. Clarifying the roles and functions behind this approach is part of the reasoning behind our company name. Everyone knows what a Sales Rep does—they convert prospects into customers. They turn qualified leads into closed deals. Expanding that role into content marketing and lead engagement doesn’t make nearly as much sense to us as redefining the social marketing functions that drive prospect engagement as Social Reps.
To use an analogy, Sales Reps convert water flowing over the dam into revenue. Social Reps focus on making sure there’s always a steady supply of water behind the dam. They do this by tuning in to market dialog, formulating content that resonates with the concerns of prospective buyers, and engaging the right market communities through social media to attract and qualify prospects that can be nurtured or introduced to sales. In this sense, Social Selling is really the coordination of Social Reps and Sales Reps to manage the qualification and hand-off of social media prospects in a way that doesn’t undermine the expectations and experience developed through social media marketing. If you’re taking pains to attract good leads with inbound marketing, and then just dumping those leads into an inside sales grinder, you’re undermining the investment you’ve made in inbound. Managing the coordination and flow of effective social marketing and sales requires three fundamental components: Intelligence, Content and Engagement. You need market intelligence to truly understand your prospects and customers and how best to reach them, you need timely and relevant content that addresses their needs and concerns at every stage of the decision-making process, and you need a seamless process of engagement that attracts and qualifies prospects, and manages the hand-offs necessary between marketing and sales—between Social Reps and Sales Reps. If you’re new to social marketing and sales and want to learn more, I would recommend reviewing the fundamentals of the Sales Funnel, read up on more recent discussions of the Buyer’s Journey, and then read any of the great eBooks published by HubSpot and Marketo. If you’ve already developed a social media practice, I would recommend looking carefully at how to expand brand-based social media and content marketing to lead engagement, particularly the processes of identifying, qualifying and engaging prospects, and how those functions can be developed in a way that enhances and doesn’t compromise your social profile. If you’re taking pains to attract good leads with inbound marketing, and then just dumping those leads into an inside sales grinder, you’re undermining the investment you’ve made in inbound. If you’re an enterprise marketing organization, and especially an organization that sells indirectly through channel partners, we have more in-depth and detailed information on social marketing and sales processes in several free white papers. Just connect with me and send a note via LinkedIn, or in a comment below.